The hardy perennial Anthemis typically flowers from summer until the autumn. Anthemis are upright plants that typically grow to between 15 and 90 cm in height. 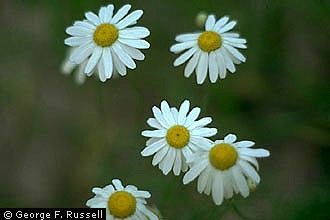 Chamomile have daisy like flowers of white or yellow, and green or silver scented leaves. 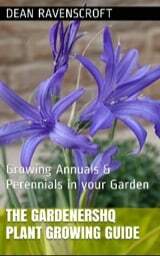 They make ideal border plants and can also be used in rockeries and in dry stone walls. The flowers of chamomile have many health benefits, and are often drank as a tea. The chamomile tea drink is made from Matricaria. George F. Russell @ USDA-NRCS PLANTS Database Smithsonian Institution, Dept. of Systematic Biology, Botany. Anthemis tinctoria (Dyer's Chamomile) by Tanaka Juuyoh. Common Names: Chamomile: Garden, English, Yellow, Oxeye, Corn, Scentless, Field. Golden marguerite, Dog fennel, Mayweed, Boston Daisy, Whig plant. Height: 6 to 36 inches (15—90 cm). Flower Details: White or yellow petals. Yellow eyes. Daisy-like ray and disc florets. Showy. Terminal flowers. Foliage: Herbaceous. Alternate. Feathery. Bright green. Aromatic (apple fragrance). Serrate. Lacy. Downy. Shrubby. Erect. Sow Outside: Seeds: Surface. Start of spring or the beginning of autumn. Sow Inside: Germination time: one to two weeks. About two months before expected last frost. Transplant outdoors just before the last expected light frost or in autumn. Space at 12 to 24 inches (30—60 cm). Requirements and care: Full sunlight for best results or in partial shade in hot areas. Good drainage. Prefers dry soils, drought tolerant, does not like humid conditions. Slightly limey soil does not perform well in heavy soils. Susceptible to mildew so grow in an area where it can receive a free airflow. Stake taller plants to protect from high winds and heavy rainfall. Divide every three years to maintain vigor. Remove spent flowers. Cut back once blooming has completed to promote bushiness. Propagate: by dividing in early the spring. Miscellaneous: The name Chamomile is derived from the Greek for ‘On the ground’ (chamai) and ‘Apple’ (mēlon). Chamomile tea is made from members of the Matricaria (link) genus as well as from Anthemis nobile. Attracts moths such as The Gem (Orthonama obstipata) and leaf miners. Anthemis tinctoria (also classified as Cota tinctoria) is used to make yellow and gold fabric dyes. It is best to sow Anthemis seeds on the soil surface, with a spacing of between 30 centimeters and 60 centimeters. Chamomile should be sown out in either early spring or early autumn. 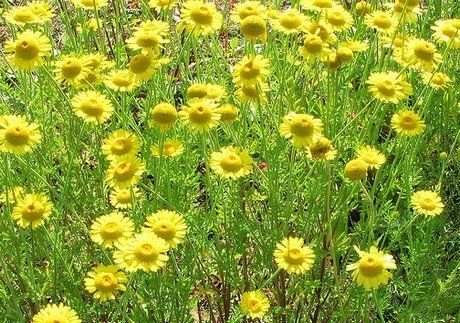 Garden Chamomile / dog fennel / Golden marguerite prefers to be grown in full sunlight, but is able to grow in lightly shaded areas. The soil type is not that important, but should be well drained and slightly limey. When starting Anthemis off from seed indoors, it generally takes around eight to fifteen days to germinate, ideally seeds should be planted eight to ten weeks before planting out in the early spring when a there is still a chance of a light frost or in the early autumn. Chamomile and other members of the Anthemis is easy to care for, however the plants are susceptible to mildew; this can be avoided by planting in an area where air can circulate. If plants are tall, it may be necessary to stake them during periods of heavy rainfall and high winds. It is important to divide the Anthemis plants every three years or so to eliminate deterioration of plants.